Co-founded by President Scott Gibson and Executive Vice President Pat Heller, Gibson International adds 160 of Southern California’s top real estate professionals and a projected $1 billion of sales volume in 2017. 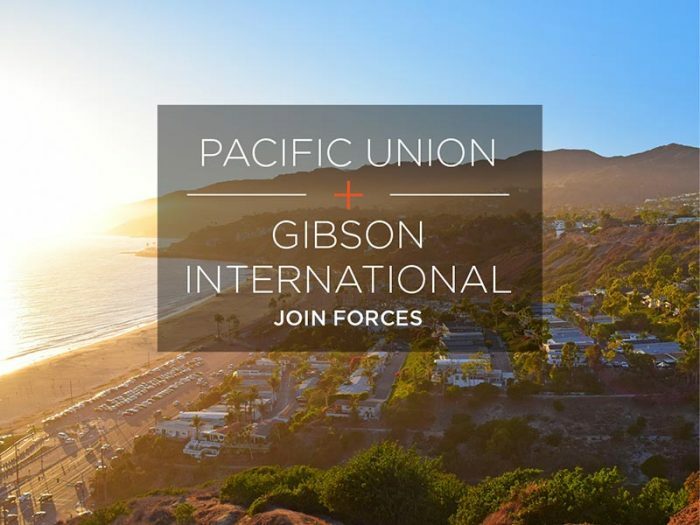 Gibson International has four offices in the greater Los Angeles area: Brentwood, Marina del Rey, Pacific Palisades, and Santa Monica. Pacific Union now is now affiliated with more than 1,660 real estate professionals in Northern and Southern California, with projected 2017 sales volume of $14 billion. We rank as the No. 1 independent residential brokerage in California and the eighth largest in the United States by sales volume, according to rankings released earlier this year by REAL Trends and RISMedia. Pacific Union has been an investor in Gibson International since 2015, and company CEO Mark A. McLaughlin is proud to join forces with the brokerage. The move marks Pacific Union’s third expansion in the greater Los Angeles area. In December of 2016, we merged with John Aaroe Group before merging with Partners Trust in August of this year. All three companies will begin operating under the Pacific Union brand in January 2018.